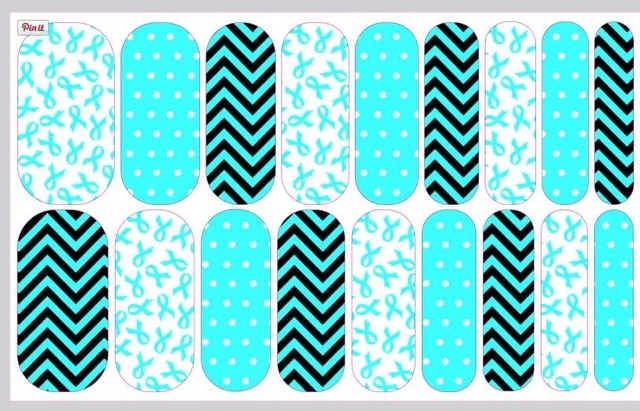 I have always loved the designs on Jamberry Nails and have wanted to make a purchase for quite a while now. Although, I was leery as to how well that they would work. Well I finally decided to take the plunge and order some from my wonderful blogger friend and Jamberry Consultant Becky @ BYBMG. 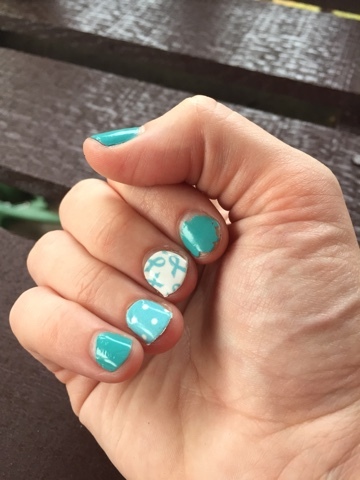 The great thing about Jamberry is you can order pre-made designs or you can create your own. 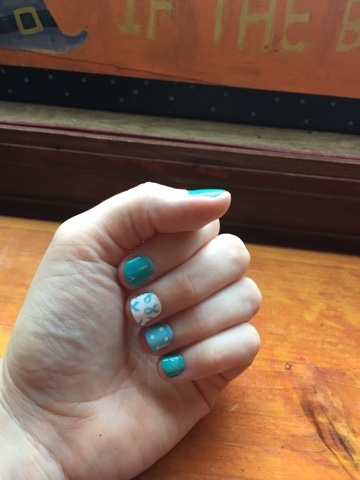 September is Ovarian Cancer Awareness month and I knew I wanted to have some nail wraps to help raise awareness for Ovarian Cancer. My mother passed away from this horrible disease so I am very passionate about raising awareness to help find a cure. Becky worked with me and helped me to pick out the perfect design. I received my nail wraps in less than a week after ordering. With one sheet which is what I got, you can do up to two manicures and two pedicures. This is the first day of application. I mixed and matched. 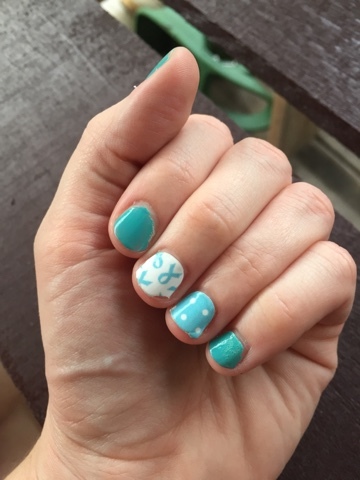 On some nails I applied nail wraps, while on others I used Sally Hanson Triple Shine in the shade of pool. It was the closest to teal that I could find. And this is how they look after 7 days of wear. They have endured several loads of dishes being done along with many other household chores and running after a toddler. They have a pretty strong endurance. As you can see in the photos, that the polish didn't hold up as well as the nail wraps. I am more than pleased with my purchase and will definitely be purchasing more in the near future. They are well worth the price. I love the fact that you can at least get up to a week's wear out of them if not more. In fact, I love them so much that I'm giving away a free set of Fall nail wraps in the color of Apple Cider to one lucky winner. 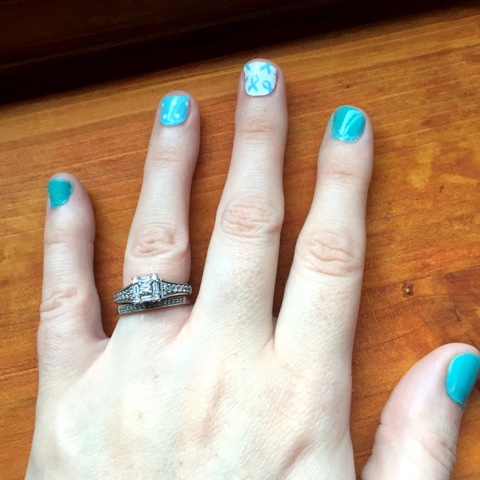 Photo shown is a mixed manicure of Apple Cider and a Jamberry polish. 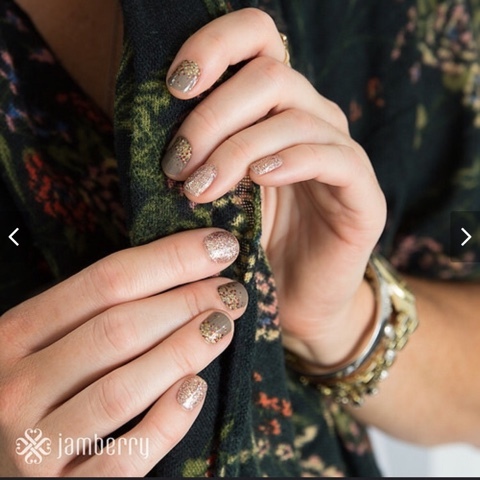 One of the joys of Jamberry is mixing and matching. Isn't this the perfect nail color for Fall? The giveaway starts today September 28th at 8am and will run through Friday October 2nd at 8pm. All you have to do is follow the directions on the rafflecopter to enter. Please be sure to follow each one carefully. The winner will be emailed shortly after the giveaway has ended. Thanks for participating! Good luck! I'm linking up with Rachel @ Garay Treasures and Becky @ BYBMG. How to help those who are grieving!